On the last day of July, I hopped into my stuffed-to-the-brim SUV and began the +1000-mile drive to St. Petersburg, Florida. I had with me my camera and my collecting gear, but also my bike, some beach wear… and my family! No, this was not a collecting trip, but a family vacation. We would be staying at my sister-in-law’s condo with my niece and enjoying typical Florida vacation fare – beaches, Disney World, sightseeing. I even brought my road bike along to enjoy some pancake-flat terrain (a rarity around St. Louis) for a nice change of pace. Still, I can be rather single-minded when it comes to opportunities for bug collecting, and summer in Florida presents opportunities galore! 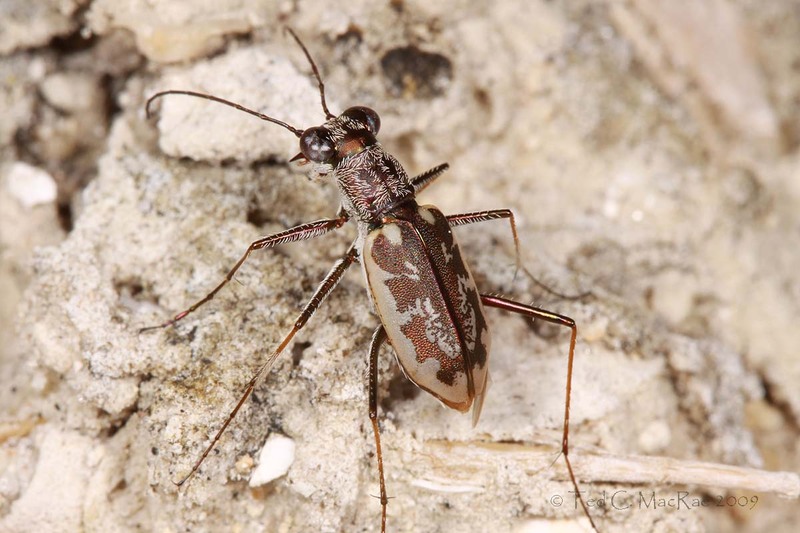 Virtually everything there is different, and while I have been to Florida a number of times, my visits have all been during spring and prior to my more recent interest in tiger beetles. It would be a family vacation, but still I would find a way to sneak off a couple times and satisfy my compulsions, and while the girls talked about Disney World and the beach, visions of Cicindela abdominalis, C. highlandensis, C. scabrosa, Ellipsoptera gratiosa, E. hamata lacerata, E. hirtilabris, E. marginata, Habroscelimorpha dorsalis, H. severa, and H. striga danced through my head! 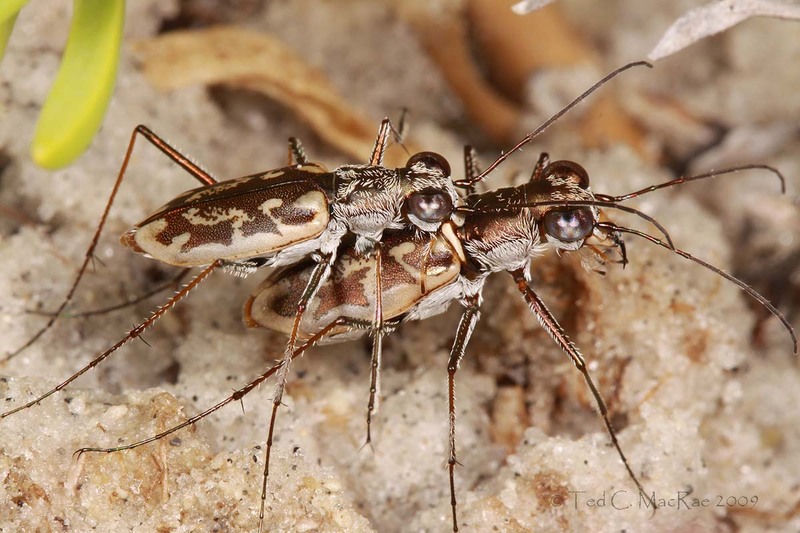 I wouldn’t have to go far to find my first Florida tiger beetles. My sister-in-law’s condo is in Seminole (west side of St. Petersburg peninsula), and as my niece and her husband showed us around after our arrival, they pointed out the “wild area” off their back patio next to the intertidal waterway and suggested, innocently, that I could go bug collecting back there. In such a developed urban/tourist area, I figured it must be highly disturbed, dominated by exotics, and offering little in the way of quality habitat for the serious bug collector. However, that night, as a cacophony of nasal queenks from the area made it clear that a healthy population of what I presume to be green treefrogs were thriving in the area, I reconsidered my skepticism and decided to take a quick look a day later. 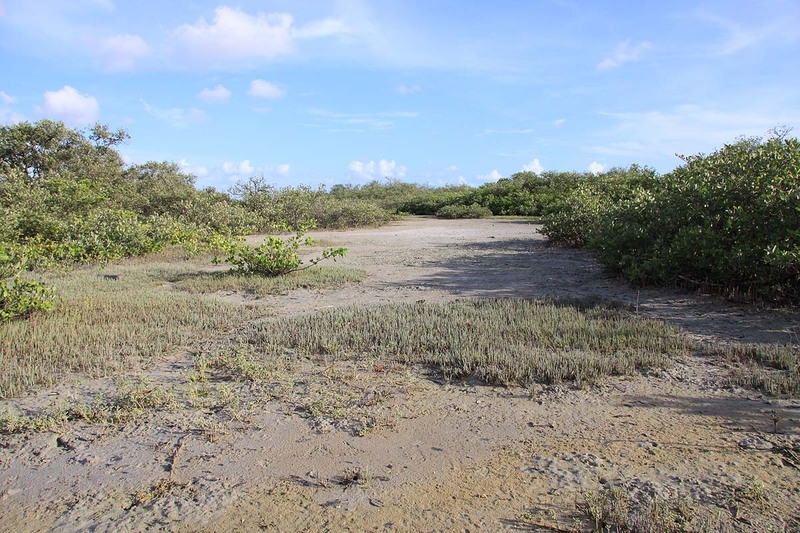 What I found was a small but high-quality strip of coastal scrub and saltwater marsh bordering the intracoastal waterway, with thickets of red mangrove (Rhizophora mangle) along the water’s edge, black mangrove (Avicennia germinans) “woodlands” in the high scrub areas, and moist, briney, barren ground in between (Photo 1). The whole area couldn’t have been more than a hundred yards wide but extended along the length of the waterway, and a wooden sign as I entered the area indicated it was a bona fide, albeit private, nature preserve established as part of the condominium development. Within minutes after entering the preserve I saw the first tiger beetle. I didn’t know what it was, and my first stalking efforts were woefully inadequate. I saw another one a few minutes later and got within net handle distance but muffed the swing. A few feet further along the path and onto an exposure by the water revealed several individuals, one of which I was finally able to capture after several clumsy misses. I hadn’t yet memorized key characters for all of the species I had the potential to encounter, but I could see in the hand that this individual almost certainly belonged to the genus Ellipsoptera (Ellipsed-winged Tiger Beetles) because of its resemblance to E. macra (Sandy Stream Tiger Beetle) and E. nevadica knausii (Knaus’ Tiger Beetle), which I had photographed earlier this year in Missouri and Oklahoma, respectively. With one now in the hand as a studio backup, I began my efforts to obtain field photographs. The beetles were extremely wary, with fast running and strong flight capabilities that made them very difficult to approach. It was only their abundance and my dogged persistance that allowed me to finally get close enough to one (Photo 2) to fire off a sequence of frames. I then spent some time collecting a voucher series – finally getting a beat on their behavior and able to capture them with a little more efficiency despite their ultra-wariness before concentrating on getting more photographs of different individuals (including those shown in Photos 3 and 4). I returned to the condo after a couple of hours – completely drenched (remember, it was August in Florida!). When I had the chance to consult my “bible” (Pearson et al. 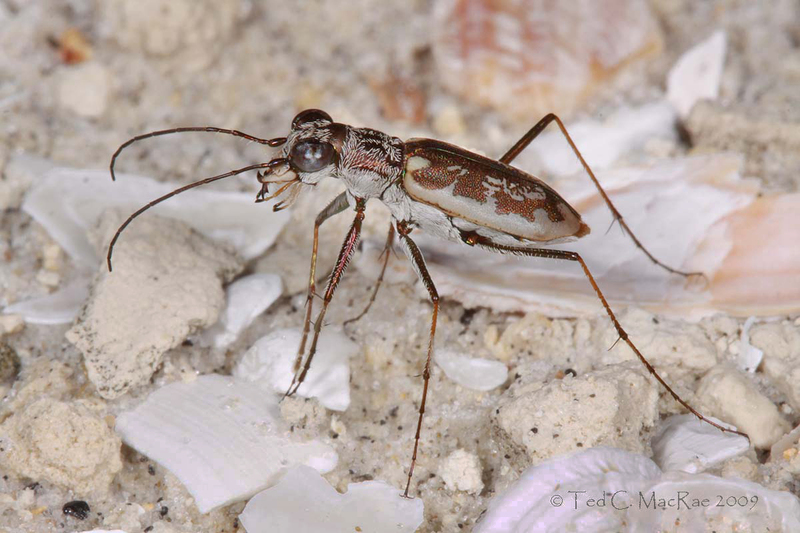 2006), I learned there there were two possibilities: Ellipsoptera marginata (Margined Tiger Beetle), occurring along the Atlantic seaboard from Maine to the Gulf coast of Florida; and Ellipsoptera hamata lacerata (Gulf Beach Tiger Beetle), resembling and closely related to E. marginata and occurring along the Gulf Coast from Florida to Texas. Both species inhabit coastal beaches, mud flats and salt marshes, and their distributions overlap along Florida’s Gulf Coast. 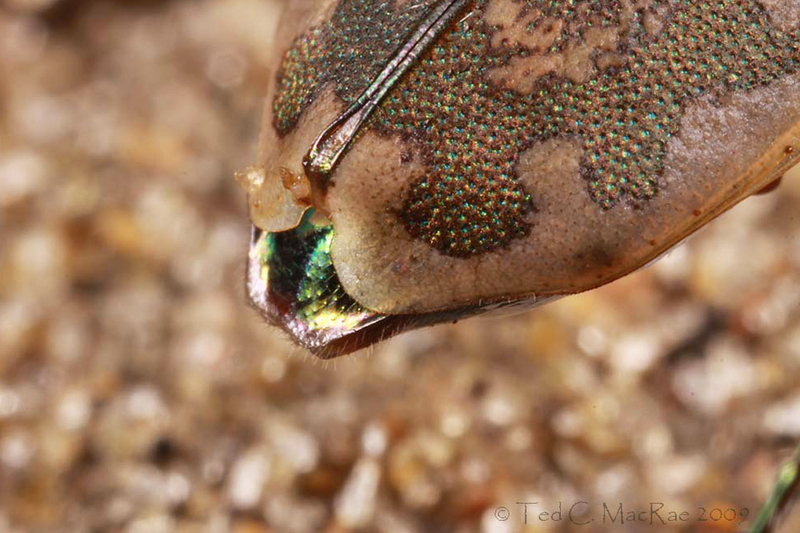 While they are easily distinguished from other species in the genus by the distinctively diffuse middle band of the elytra, distinguishing between the two requires examination of the male right mandible (marginata bears a distinct tooth on the underside, hamata does not) or female elytral apices (marginata curiously bent down at a 90º angle, hamata not). At this point, I didn’t know if I had one species or two – and if I did have two, did I have photographs of both (and would I be able to identify them)? Fortunately, closer examination of the voucher series I collected revealed both species present, and even more fortunately I had managed to get photographs of both. The individual in Photo 2 is a male, and the angle of the photograph clearly reveals a distinct tooth on the underside of the right mandible, identifying it as E. marginata. Photo 3 is another male, and although the angle doesn’t afford a view of the mandibles, what can be seen is a bronze cast to the pronotum – in my voucher series, all of the E. marginata specimens have a bronze cast to the pronotum, while the E. hamata lacerata specimens exhibit an olive cast. This suggests that this individual also represents E. marginata. In Photo 4, no tooth can be seen on the male mandible, but the angle of the photo doesn’t necessarily make it visible were it to exist. The male does, however, exhibit an olive cast on the pronotum, and the female elytral apices show no indication of being bent down as would be expected for E. marginata (see Photo 5 below of E. marginata photographed a few days later at another locality). As a result, the individuals in Photo 4 can be identified as E. hamata lacerata. Ellipsoptera marginata - female elytral apices showing curiously "bent tips"
Of the 19 vouchers that I collected, 15 represent E. marginata and 4 represent E. hamata lacerata. This exemplifies the challenges of field identification and photography of insect species in unfamiliar places. Had I been satisfied with photographing only one or two individuals of what I thought were all the same species, I would have missed one of the species. The experience further exemplifies the importance of adequate voucher series, as it was only a result of close examination of that series that I realized two species were present. Based on the numbers of individuals that I collected, as well as the photographs that I took, it appears that E. hamata lacerata was much less common at that location than E. marginata. This difference in population density between two similar, co-occurring species emphasizes the importance of sampling an adequate number of individuals at a given location before concluding what species are – and are not – present. This entry was posted in Cicindelidae, Coleoptera and tagged beetles, entomology, Florida, Great Plains, insects, landscapes, nature, salt marsh, science, taxonomy, tiger beetles. Bookmark the permalink. It occurred to me when reading this that it would be great to see a few video sequences of you stalking, netting and photographing tiger beetles. Educational for we wannabes, and probably quite entertaining! Videos of my clumsy misses would probably be the most entertaining sequences. I was thinking more in line with the video capabilities of your typical compact camera, but a TV series would be great! With a title like that, how can I refuse! It’s on the list. Beautiful photographs and a great detective story of the whole episode. The difference in the numbers you captured could also be due to differences in behavior of the 2 species; one might be more wary, more elusive than the other. Definitely supports the need for extensive sampling before concluding what is there or not there. Thanks, Wilma – and that’s a great thought. I encountered the two species a few days later ~200 mi to the north and found a similar relative abundance – at least in the specimens that I was able to capture. I know some people avoid the whole stalk and capture ordeal by using wasp/hornet spray. This is certainly more efficient than collecting with a net and would be a good way to avoid sampling bias. Still, something about that really rubs me the wrong way – both the idea of spraying poison into sensitive habitats, and the fact that is just doesn’t seem “sporting”. I’m going to get the chance to have a Florida tiger experience starting one week from today. Like you, the only trips that I have made out that way since developing an interest in these guys have been at the wrong time of year (February). It’s too late for some things, but according to Pearson, there is still a bunch of stuff I might see. My two main quarries will be hirtilabris and trifasciata. Good stuff from you. Instead of Tigering with Ted, I’d like to do Ted and Doug’s Excellent Tiger Adventure. Where are you going? I found hirtilabris at Withlacoochee State Forest in the northern side of the Citrus Tract on sandy 2-track. It was exceedingly difficult to photograph! You should find trifasciata without much problem along the coast. For good bang for the buck, go 11 mi south of Jena (Dixie Co.) to the end of Hwy 361 – there were 5 species out when I was there (trifasciata, togata, marginata, hamata, severa), and if I could’ve stayed and done some blacklighting I might have found striga. I’m sure we would have a most excellent adventure if we got out in the field together – enough talk, let’s just do it! The end of Hwy. 361 is one of the places I’m planning to stop. I doubt that there will be 5 species this late in the year. Was togata abundant? According to Pearson it could still be out, and is one that I’d love to see. Of the others that you mention, Pearson indicates a good possibility for hamata, but puts October too late for marginata, severa, and striga. I’ll be hanging out near the Gulf west of Gainesville. I only saw three togata while there, but that was summer. I saw decent numbers of its northern subspecies (globicollis) during my Oklahoma trip a couple weeks ago, even though it was cloudy, cold and windy. I’ve also seen decent numbers of the nominate form at Boca Chica (southern tip of Texas) during October – you might have luck with it. Thank you, Diane. Your nice comments are greatly appreciated. Beautiful photos and interesting story as usual! Hi Trevor – you kind comments are always appreciated. These are great shots of some beautiful insects! I especially like the size comparison obvious with the mate guarding image of E. hamata lacerata. Great detective work, by the way. Though I’ll admit at first I thought you’d walk away empty handed with all the misses. But you saved your reputation with success on two species. I’m just in awe that you were able to do this kind of observation and collecting mid-day in August in FL. You are a tough man! Hi Alex. Yes, the conditions were tough. However, July/Aug here in Missouri is hardly any better, so I was pretty well adapted to it by that point. Still, there’s a certain amount of satisfaction that comes from beating heat, terrain, etc. to locate a target and get the shot. This is pretty interesting stuff. I love how detailed your pictures are – what kind of camera are you using? Thanks, Michael. These shots were taken with a Canon 50D and a variety of lenses – for the landscape I used a Canon 17-85mm zoom, and for the insects I used a 100mm macro (full insects) or MP-E 65mm macro (elytral apices closeup) and a MT-24EX twin flash. You can see the setup in my post, BitB Goes dSLR. I ran across this report while thinking of a trip to FL myself. One other possibility occured to me that could explain the fact that you collected more E. marginata than E. hamata lacerata. The marginata might not be as flighty as the other. If that were the case, the E. marginata could actually be the one that is less common. I would think the only way to know for sure would be to do catch, mark, release and re-capture studies. Great photos! I know by experience how hard those can be to get. Hi rmcclsky – That’s always a possibility. However, I did return to the area this past August and spent several evenings in the marsh. The tigers were out but far less active, so I was able to get what I consider a representative sampling, and E. marginata still far outnumbered E. hamata lacerata. I saw the same thing further north at “Road to Nowhere”. There might be other habitats along the coast where the reverse is true, and I think we’re still just beginning to learn the factors that attract one species over another. It’s a pleasure to see such a nice blog dedicated to the Coleptera! Many thanks – it’s a pleasure to meet readers who appreciate it.